A 2.4-kg ceramic bowl falls to the floor. 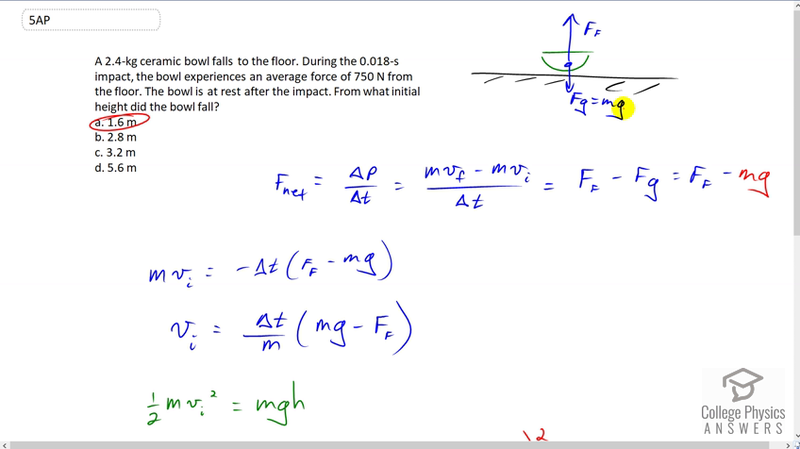 During the 0.018-s impact, the bowl experiences an average force of 750 N from the floor. The bowl is at rest after the impact. From what initial height did the bowl fall? ed1ch08ap05 This is College Physics Answers with Shaun Dychko. This bowl will be hitting the ground and when it does so it will experience a force of gravity downwards equal to mass times gravitational field strength g, and then a force due to the floor upwards. That net force which will be the up force minus the down force is going to be the change in momentum over change in time and so that's mass times final velocity minus mass times initial velocity divided by time. That's going to be force due to the floor minus mg substituting mg in place of F g there. Now the final velocity of the bowl is zero so that term disappears and so this becomes negative m vi over delta t. We can solve this for m vi and that's useful because we can get an expression for the height above the table that the bowl must have started in terms of vi. Then we'll substitute for vi in place of vi in this formula for h. So, we have m vi equals negative delta t times force of friction minus -- or force due to the floor -- minus mg. We got that by multiplying both sides by negative delta t here and here. Then you know it's nicer to have fewer negative signs so we multiply by negative one over negative one which makes this positive, and then this negative one will divide into this bracket here which changes the sign of both terms in there so the mg becomes positive and the force due to the floor becomes negative. So we have vi equals delta t over m times mg minus force of the floor. Then the kinetic energy that the bowl has just before collision with the floor is equal to the gravitational potential energy that it had initially at the top of the table. We will solve for h by dividing both sides by mg. The m's cancel in here, we'll switch the sides around and we have h is the initial velocity just as it's hitting the floor divided by two g. This initial velocity, I mean initial is just when it is hitting the floor, not when it is at the top of the table. So, we have an expression for vi. It's here and we can square it and then substitute it in. So that's delta t squared times mg minus force due to the floor squared, divided by mass squared times two g. So that's 0.018 seconds squared, times 2.4 kilograms times 9.8 minus 750 Newtons force exerted by the floor given to us in the question, and we square that difference, divided by 2.4 squared times two times 9.8 meters per second squared giving us a height that must have been 1.51 meters. Now it turns out that 1.5 is not one of the options here but 1.6 is the closest answer and so we'll take that. The people making these options must have neglected to include the force due to gravity in their calculation. So the difference that would make is that this term would disappear and if you do that it makes that zero and assume it's not there then you would get 1.6. But the better answer is 1.5. But we will take A as our answer.